Have You Ever Pushed The Safety Envelope To Get A Good Shot? I think we can agree that with the exception of a photojournalist working in a war zone, most people would not consider photography to be inherently dangerous. That is unless we decide to push the limits ourselves by taking some risks. Over the last several months I have seen some photos that clearly involved people putting themselves at some kind of personal risk to get the photo they wanted. Frankly, this is something I didn’t think about all that much. As I have shared with you all before, I enjoy sports action photography and cityscapes the most. When I am taking photos at sporting events, it’s pretty easy to position myself so I don’t get run over by basketball or football players. And when taking pictures around the city, the only thing I need to worry about is not crossing against the light and getting hit by oncoming traffic. However, I have recently decided to spend more time taking pictures of the Arizona landscape. Most people think of this part of the country as desert. That is true to some extent, but northern Arizona is all mountains, gorges and canyons. In fact, Flagstaff, AZ sits at a higher elevation than Denver, CO (my hometown). Last spring, one of my very good friends came to Phoenix for a wedding, and we decided to take a day trip to Antelope Canyon, which is near the town of Page, AZ. I had seen some pretty amazing shots of the canyon, so I thought it would be a great opportunity to get some good practice at landscape photography. There was only one problem. Antelope Canyon is a very popular tourist stop and we were going at time when things were just starting to get busy. We paid for a standard tour. There were also guided tours that were especially set up for photographers, but they cost quite a bit more. It turns out that it wasn’t that great an experience. It was very clear that tourism drove the local economy. And these tours ran like clockwork. The guides didn’t really allow time to take any quality photos. And the interesting thing was that the tour guide companies were conducting the photography tours at the exact same time. So they weren’t really getting a whole lot of opportunities either because that part of the canyon was packed with tourists. If I had paid for that tour, I would have felt like I’d wasted my money. I took several dozen photos, but even without looking at them, I had a sense that I didn’t get anything all that memorable. I was beginning to think that aside from having the opportunity to catch up with my friend, the trip had come up short of my expectations. We decided to drive over to Horseshoe Bend, which was only about 15 minutes away. This is another very popular spot where the Colorado River make sharp 180 turn through Glen Canyon, which is about 140 miles from the southern rim of the Grand Canyon. I believed that I could still salvage the photography part of the trip if I could get a good shot here. It was about a 20 minute walk down to the edge of the canyon from where we parked. The first thing I noticed as we approached was that there were no guard rails to keep people back from the edge. I had a couple lenses to choose from including an 18-55mm and an 18-105mm. So the question became just how close I was willing to stand to try and get a shot of the entire Horseshoe. I wouldn’t say that I have a fear of heights; just a healthy respect for high altitudes. I tried taking some shots standing about 10-15 feet away, but even at the widest angle I wasn’t coming close to getting everything I wanted. And the higher rocks were too far back to get the bottom of the Horseshoe. So my only option was to try and get a little closer. I wasn’t going to be one of those daring people who dangled their feet over the ledge to get the shot. The drop is over 1,000 feet to the bottom of the canyon, and I’ve seen my share of photos on the internet taken moments before someone took a wrong step and fell. So I decided to sit down and move within about three feet of the ledge. That way I would still have a nice solid base. Then I just held my camera over my head and took a series of shots hoping I could capture one that worth keeping. I didn’t have the right lens to get the entire horseshoe bend and the talk rock on the opposite side of the river. But I was able to get one that provided some great perspective on the sheer enormity of this part of Glen Canyon. If you look really close, you can see a boat on the river. At over 1,000 feet away, it appears to be a small white dot. best I could do under the circumstances. See the boat? So that’s my story on how much I was willing to push the safety envelope to get the shot I wanted. The answer is not terribly far. I just didn’t feel that comfortable standing that close to the ledge with other people standing around. All it would have taken was for someone to stumble and bump into me. And then who knows what would have happened. That’s why sitting on the ground seemed to be the safest play. I must have taken about 30-40 shots, but I found one worth keeping. At first I was disappointed that I didn’t get the entire lower edge of the bend, but from where I was sitting, that was as good as it was going to get. I’ve also talked to other photographers who have taken shots from that same location, and they said it is extremely challenging to get the entire bend and the rocks on the west side without being on some kind of elevated platform. Given the tools that I had to work with, I was happy with the result and felt like that made the trip worthwhile. Do you all have any examples where you pushed the limits even a little bit? I would be interested in hearing about them. Feel free to share them in the comments section. Good luck getting that great shot, but most importantly, stay safe! Until next time . . . Even before I took up photography, I have always appreciated a really good sports action photo. In a future blog, I'll share what I consider to be my top five, but today I wanted to share five tips that can help you take better sports action photos. I have used them over the last several years, and I have managed to get some nice shots in a few different sports. So here we go . . .
Like anything else, getting a good sports action photo takes preparation and planning. And that starts with knowing the sport that you are going to shoot. I've spent the most time shooting basketball and tennis. I've also spent some time getting shots at a spring training baseball game. By "knowing the sport", I mean understanding how to watch it. I prepare for shooting these sports by looking at photos that professionals take to note the sight lines they are using. Then when I get to the location, I take some time to walk the areas where I think I'll be able to take some good shots, depending on the crowds and the position of the sun. When the game starts, my goal is to shoot from at least three or four different locations so I can get a little variety. One other thing to keep in mind when it comes to knowing what you are shooting: identify key players and note their tendencies. This will help put you in the right position to get a good shot. There is nothing better than having the action come right at you as you are trying to get one that is a keeper. I went back to the photos I took at BNP Paribas Open tennis tournament at Indian Wells last year. The practice schedule showed Eugenie Bouchard practicing in the early afternoon. She was expected to go deep into the tournament, so I figured there would be plenty spectators watching her practice. I got there a little early and found spot where she would be hitting right to me. I didn't have any credentials, so the closest I could get was the first couple of rows in the stands next to the court. It turns out that was good enough. Here is a nice shot I got of Bouchard's forehand. Once you are able to identify a good spot, your next goal is to get shots that are as tight possible. It is a great way to bring the person viewing the photo into the action while eliminating whatever is not relevant to the shot. Cropping the shot later will allow you to do that even more. The photo here is the same one of Eugenie Bouchard taken above, but I cropped it tighter to eliminate the guy standing behind her. See the difference? Now it seems like she is playing against me. One other thing to keep in mind. Don't get into a rut holding the camera the conventional way all the time. It might feel more natural, but in certain sports, going vertical can provide a much better perspective. Facial expressions and emotions are such a great part of sports action photography. That is why I tend to favor sports where you are more likely to capture them. It's one reason I haven't spent a lot of time taking pictures at football games. Although I will say that getting that facial expression through the helmet is pretty cool. Sometimes you can get some nice shots even if it's slightly away from the action. Here is a a photo I got at a youth basketball game a few years ago. The players are preparing to grab the rebound on a free throw attempt. They are about 12-13 years old. I recall that this was a pretty close game and every possession counted. You can see the anticipation on their faces as the free throw approaches the rim. I don't remember who got the rebound though. This shot could have been framed a little better because I cut off the last three fingers of the middle player. I did manage to capture it in the very next frame, but I liked these facial expressions better, which was what I was trying to get. I also wasn't able to get the left hand of the player on the right. Here is a second photograph from another game. This player is actually my son. He was nine years old at the time. In this shot, he had just grabbed a defensive rebound, and had begun bringing the ball up the court. This one caught my eye because of the intense focus on his face. I find shots like this one to be just as, if not more, compelling when shooting youth sports. One thing that happens to me when I go shoot sports is that I start to get caught up in the game and I stop shooting for a while. This is especially true when I am watching my son play. But I have tightened that up quite a bit lately by designating blocks of time during the game when I will concentrate solely on taking photos. The key is to get out there as much as you can so you can keep honing your skills. You may not get to the 10,000 hours that Malcolm Gladwell espouses, but every hour counts. Your sense of anticipation and timing will improve, and that can be the difference between a good shot and a great one. One mindset I have always had is that no matter how proficient I feel I have become at something, I know what I don't know. It's no different with photography. I have two friends that I often talk to prior to shooting a particular event. One was a professional and still has an incredible portfolio of photos taken all over the world. And after I finish, I usually send them some of my shots to get their feedback. I also submit some to photography blogs and forums on Reddit as well as posting them on Imgur. I am very open to constructive feedback, and when other photographers see that you are trying to improve, they are very helpful. So those are five tips that I always try to keep in mind whenever I go out to take sports action photos. If you have others that have helped you, feel free to leave them in the comments section below. Good luck as you continue sharpening your skills as a sports action photographer! Until next time . . . Looking For A Really Good Book On Photography? When I first got interested in photography, the amount of educational material available was pretty overwhelming. And it’s even worse now. For example, I just went to the Amazon website and typed “Photography Books” in the search box. That returned over 241,000 results. Using some good filtering techniques (four stars or higher, digital photography, and new releases), I was able to get that number down to 50 pretty quickly. But at the end of the day, I thought it made more sense to see what those who have been at it longer than me would recommend. My dad has been an avid photographer since his days in the military. In fact, he has a Leica camera that is at least 50 years old and still in perfect working condition. A couple years ago, he bought me a book called Digital Photography Masterclass by Tom Ang. It was exactly what I needed to improve my skills. This book has great tutorials that cover every aspect of photography. This book is set up in such a way that makes it very easy to learn the concepts that the author covers. Each chapter is basically a tutorial on some aspect of photography. The first five tutorials help you to get a better understanding of how your camera works. It covers topics such as key camera controls, and exposure. Then there are four chapters that review the elements that will further develop your skills like mastering composition and using available light. After that, Ang takes us into the darkroom to show how to use the available software to perfect the image. Finally, the last seven tutorials cover a specific type of photography (travel, portrait, sports, etc.) that will enable you to focus on the category of your choosing. I also like how the book reinforces the concepts. There is an assignment at the end of each tutorial that helps you apply the information that you’ve read. This method of learning has been proven to be very effective, and it’s especially true in photography where the feedback now is practically instantaneous. In this age of digital photography, it is possible to review your work immediately following your session. I find this short turnaround time to be very motivating. Not only am I able to see what I did right, but I can focus on the areas where I didn’t get the desired results and make a note on what I need to do to have a better outcome next time. 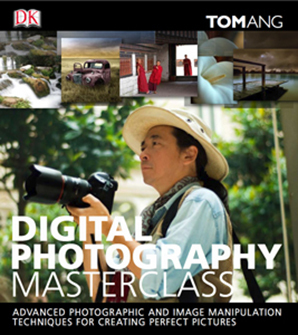 So if you are looking for a great book to teach you the basics as well as the finer points if digital photography, you don’t need to look any further than Digital Photography Masterclass by Tom Ang. It is extremely well organized, and the author’s writing style makes it very easy to read. At the time of this posting, there is a 3rd Edition available on Amazon in paperback for around $20.00. I think you will find it to be a very worthwhile investment. Until next time . . .
What Is Your Favorite Camera Lens? When it comes to any of my hobbies, the whole "What is your favorite . . .?" conversation is one that I always enjoy. And with photography, it is especially interesting because there are so many things to consider. The first consideration is obviously what you enjoy shooting the most, and there are quite a number of categories. There is landscape photography, food photography, night photography, candid photography, and action photography, just to name several. The fact is you can get as granular as you want here. But no matter what the choice, photographers always have one go to lens that will get them the results they are seeking. I happen to really enjoy sports action photography. And for that, the lens I rely on the most is my Nikon 70-200mm zoom lens. 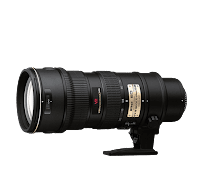 The full name is the 70-200mm f2.8 ED VR II AF-S Nikkor Lens. It is extremely versatile and is an outstanding choice for sports action photography for three very important reasons. The zoom range of 70-200mm gives me a pretty effective shooting range of about 15 - 150 feet while having the ability use the full frame on the subject. That's going to vary a little bit depending on how much background you want to include, but it is a good working distance for just about any sport. This lens has an f/2.8 aperture, which makes it ideal for shooting indoors where there may not be as much light. This lens will pull in as much light as is available to give you the best opportunity to take a good photo. That's important when you are working with shutter speeds of 1/800s or faster. That's not a lot of time, so having a lens that can capture the most available light in these situations is preferred. Slowing the shutter speed allows for capturing more light, but there is a pretty good chance that your subject will be blurred. You will still need decent indoor lighting but all things being equal, you have a much better chance of a getting a quality shot in a gym using this lens compared to one with a higher minimum aperture. I tried taking sports action shots indoors with my 55-300mm lens with a minimum aperture of f/4.5, and the results are markedly different. The shots are so much darker and many of them were unusable due to the inadequate lighting in the gym. The sharpness that this lens provides throughout the entire range of 70-200mm is excellent. The earlier version was notorious for the images having "soft corners". One common metric that is used to rate lenses is called the blur unit. And the lower this number is across the frame, the better. At f/2.8, the blur units are no higher than 1.5. There just aren't that many lenses out there that can give you that kind of sharpness at that aperture setting. And that is what makes this lens a great choice for sports action photography. Here is one of my favorite shots taken at a spring training baseball game earlier this year. So those are main reasons why the Nikon 70-200mm f/2.8 Nikkor Lens is my favorite. 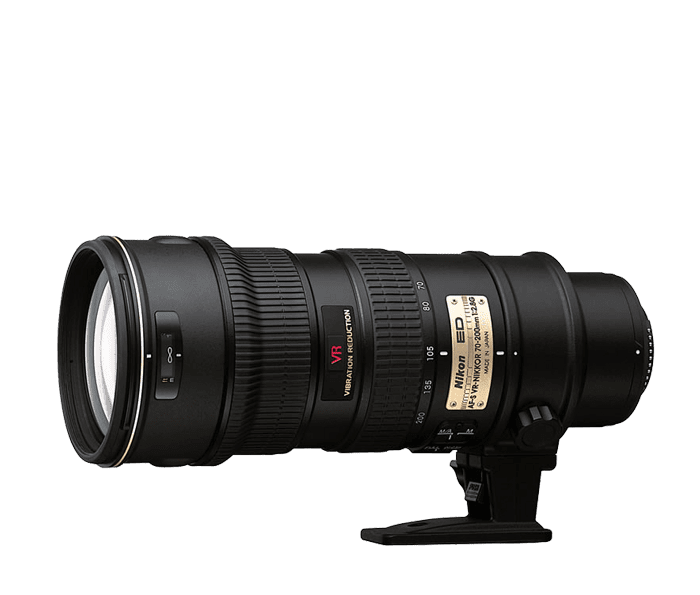 I do have three other lenses, but when I want to take sports action photos, whether I am indoors or outdoors, I'll always go with my trusty 70-200mm zoom. Now, it is a pretty heavy lens, weighing about 3 lbs. 6 oz. But I'll gladly haul it around. It's a small price to pay for the kinds of shots I have been able to take with it. What is your favorite lens to use and why do you like it? Please share your comments below. I am always interested in learning more about what other photographers, especially the seasoned amateurs and professionals are using. Until next time . . . Besides sports action photography, I also enjoy taking shots in different cities; and the more historic, the better. That is why Washington D.C. is hands down my favorite city to visit. I know there are older cities, but what does it for me is the monuments. I never get tired of taking photographs on the National Mall. And the city itself has its own unique vibe. I love riding the Metro to go to the museums, and D.C. has just about any type of restaurant you can imagine. One of the more interesting discoveries I made during my last couple of trips is how different the monuments and memorials can look depending on the time of day the photograph is taken. I am a big fan of shadowing. 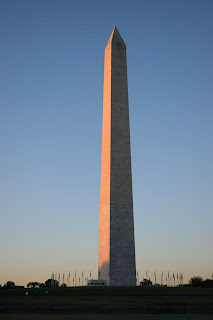 It can create a really nice perspective, so I do spend a little time noting how the sun is hitting a particular monument. I also like shooting in the early part of the morning. Taking photos in the 30 minutes before and after sunrise and sunset can add a completely different dimension to your photographs because of the colors that are visible during that time of the day. Here is what I mean. Below, you will see two photos of the Washington Monument. One was taken in Oct. 2015 during the later part of the morning. The second one was taken a year later from a spot that probably wasn't more than 40 - 50 yards away from the original one, but the time was about 20 minutes after official sunrise. I should also mention that these were two photos that I did not use any editing on in order to enhance them. You are seeing exactly what I saw. As you can see, the weather was absolutely perfect on both of these days. I am taking both shots while standing northeast of the monument. The sun is just out of frame to my left. It is really amazing how much of a difference several hours can make with respect to the colors that you see in a photo. In the first one, the shadow on the nearest face is clearly defined against the blue sky. And you can see the distinct contrast between the monument face catching the sunlight and the one that is shaded. In the early morning shot, the shadowing is still evident, but the terrific colors that are best seen at sunrise are clearly the distinguishing features. This was one of my favorite shots from that particular trip. The one thing I had not had a chance to do in D.C. is take photographs at night. So on my last trip I booked a guided tour in the evening that made a few stops for people to get out and take photos. In the shots of the Washington Monument above, you saw the difference that a few hours can make. Below, you will be able to see the how much different things can look at night. These two shots were taken at the wall of the MLK Memorial that extended north towards the Washington Monument. The first one was shot in the afternoon.The second one was taken the following year in the evening. I was standing almost in the exact same spot. For the night shot, I used aperture priority and let the camera select the shutter speed and ISO. I also used a tripod to eliminate any camera shake. Before I comment on the shots, let me just say that if you haven't had a chance to take a D.C. Monuments tour at night, I highly recommend it. I can't even really describe it. To see them lit up and everyone walking around quietly creates an atmosphere of reverence that you don't feel quite as much during the day. Anyway, I really liked how these two shots turned out. From this spot, the Washington Monument is about a twenty minute walk. I was a little amazed that there weren't any people in the day time shot, but they were all behind me looking at the huge sculpture of Dr. King. Capturing the tourists in the evening shot adds to the effect I think. Obviously, some of them were blurred because they were walking and their motion combined with the slower shutter speed necessary to let in the required amount of light made for the slight distortion. But I actually like it. So those are just a couple of my favorite shots of Washington D.C. There are dozens more on my Shutterfly page, so if you would like to take a look, feel free to leave your email in the comments section, and I will add you to my list. I just wanted to share some of the things I enjoy about taking photos at different times of the day to demonstrate how much of a difference several hours or more can make even when you are shooting from almost the exact same spot. What cities do you enjoy the most when taking photographs? I would be very interested in seeing some of your favorites along with your comments on what you like the most about them. Until next time . . . I became interested in photography several years ago. I enjoy taking action sports shots when I can. I also like cityscapes either during the day or night and photographing historic monuments like the ones found in Washington D.C. It is my favorite city to visit for just that reason. In addition to finding new and interesting places to photography, I also help run a website that sells variety of camera bags and accessories. So whether you are a new or experienced photographer, come and visit our site. We have something for everyone.